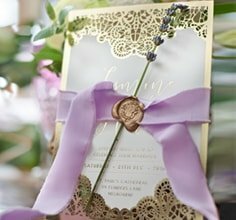 Looking for the Best Wedding Invitations Provider in Melbourne? Giant is a Melbourne based wedding invitations specialist, with a passion for crafting beautiful, personalised invites, stationery and accessories for Australian couples. We understand the importance of your big day - from the very first time that your guests open up your invitation, the tone and the theme of your wedding day is set. Thus, in order to create a truly cohesive set of wedding stationery cards, each one of our invitation designs come with a full range of matching stationery accessories. We know how stressful planning a wedding can be, so we’ve got your Save the Date, RSVP and Thank You cards all in the one place. We boast the largest range of quality, handmade invitations with a range of stock options, latest technologies in print techniques for the unique look. Our elegant, designer invites are sure to inspire your guests and get them excited. Simply browse our endless selection of over 300 designs and discover a card that suits your unique wedding theme and décor. Whether it’s for a rustic chic outdoor celebration or for a modern and elegant ceremony – we’re sure to have a luxurious option for you. We stock a range of styles from classic, romantic and elegant themes all the way through to vintage inspired creations. Swarovski crystals, gold foiling and traditional thermography printing all feature among our stunning designs. To make the selection process even easier for you, you can take home 5 FREE samples. These will be dispatched from our Melbourne depot on the same day we receive your request. Each invite style comes in a number of colour and custom themes – so you can choose one that best represents your style. Once you are satisfied with your choice, our user-friendly ordering process on our website will enable you to fully customise your invitation colour theme, font, wording and finishing accessories such as seal stickers and envelopes. Short for time? We can also print guest names on your envelopes and table cards for you, taking out the headache of DIY preparations allowing you to focus on more pressing arrangements. We are continually updating our range, and our wedding invitations have been inspiring Melbourne and Australian based happy couples as well as worldwide customers.